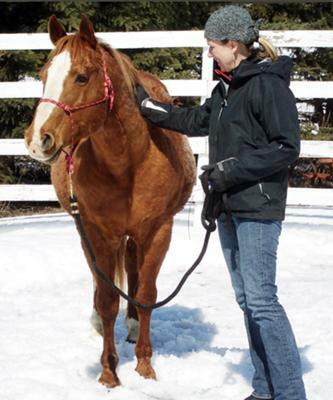 I was sent a message regarding a herd of horses who had just been rescued from unbearable conditions. There were six of them, Red a quarter horse stallion (17 yrs old), three mares and two babies. One baby had already died unnecessarily. Thank goodness the Humane Society was able to remove them. Rachel, a student of mine at the time was considering ownership and so we went to have a look at Red. It was hard to see the once proud stallion inside the underweight, flee invested poor condition body. But the twinkle in his eye revealed a strong quiet will to go on. After all, even in the poor living conditions he managed to continue to reproduce! First thing however as protocol for the humane society, he had to be gelded. Even at his age, he came through like a true soldier. He had the sweetest disposition I have seen in a long time, and Rachel fell in love. We spared no time getting him to my place to start his road to recovery the natural way. It's been a long road with proper barefoot trimming, good quality hay, equine dentistry done, new heard mates and lots and lots of love but what a payoff! He's a true gentleman, loves attention and after a year of just playing games from the ground with clicker training and natural horsemanship methods (while we waited for his health to come fully back), he's ready to ride (bitless of course!). Oh, and his most favourite game is to pick things up with his mouth. Interesting challenge since he had worn down most of his front teeth from searching for food! Rachel is like an angel who pulled him out from the ghetto and he will now live his life in luxury! Is it a coincidence that Rachel owns a specialty retail shop downtown Toronto called, are you ready for this, Red Pegasus!! So this match was truly meant to be, don't you think? What a great story Elaine, I just love hearing about horses like Red who have been given a wonderful new (natural) life - thanks so much for sharing it. Comments for FROM RAGS TO RICHES!